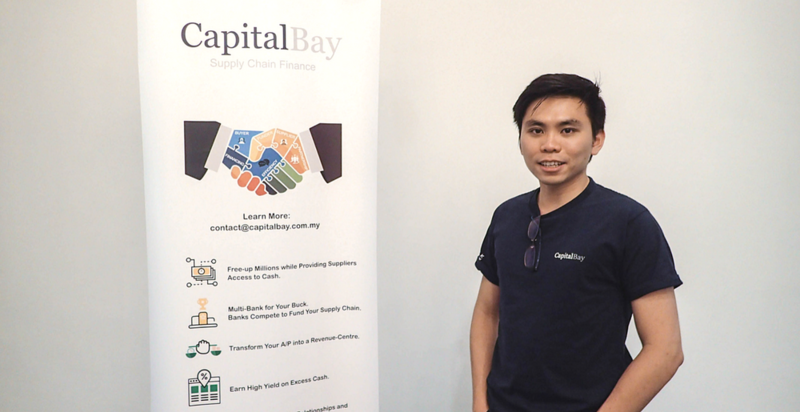 CapitalBay is a startup that wants to help solve the issue of cashflow afflicting many startups and small businesses. According to this Malaysian startup’s analysis, SMEs in Malaysia now have to wait 50% longer before they can collect their invoice payments compared to just 3 years ago. When small businesses supply to corporates, the money doesn’t always flow back smoothly. This is generally due to the red tape and procedures that corporates need to go through before the money can be funnelled out. Meanwhile, raw material suppliers are knocking, and there are also operational costs to consider. This often leads supply-based businesses to borrow from banks to make ends meet. So even if you could theoretically keep your business afloat, you still need a bit of loaner cash floating in order to make month-on-month costs meet. A pain point all too familiar by the three Malaysian founders of CapitalBay—Ang Xing Xian, Edwin Tan and Dion Tan—the trio come from extensive finance backgrounds. This is the exact market infrastructure that CapitalBay is attempting to fix. To Singapore-based VC KKFund, the solution proposed by CapitalBay is worth something to the tune of RM2 million investment in a recent seed funding round. By partnering with existing financial institutions, CapitalBay ensures that any invoices are paid for fast, through these financial institutions. Meanwhile, corporate clients now still owe the same amount of money, but to the financial institutions. At the same time, large corporate buyers can extend their payment terms in a sustainable manner, thus reducing overall cost in the supply chain. Therefore, instead of small businesses having to apply for loans on their credit, financial institutions can base the credit score on the clients instead—granting small businesses some discounts. Because of the complexity in trying to streamline the finance chain is in Southeast Asia, setting up all of the legal groundwork took CapitalBay most of their 2-year timeline since inception, meaning their official launch was very recent. Nevertheless, they already have big players on board. A platform that connects them to a large network of corporate supply chains all in one place. The need for them to develop and maintain a platform that can support and execute transactions reduces. It’s more cost-effective than having to on-board suppliers. This, on top of a combination of security features, propriety risk algorithms, credit assessment, and the always popular buzzword—big data—in trade data analysis seems to justify the large investment of RM2 million in their efforts towards offering a secure platform for all the 3 key stakeholders. So what are they going to do with the RM2 mil? Considering the role that they intend to play in the market, CapitalBay has always planned to raise their seed round after they’ve secured their initial clients, who serve as real-life proof-of-concepts for what they’re trying to do. Their song is a familiar one. The new round of funding will be used to accelerate their product development, add to their team, and to acquire customers. They’ll also be continually developing their tech to help on the user experience front–from the on-boarding process all the way to subsequent transactions. Of course, there are going to be drawbacks for attempting to introduce a potentially game-changing solution to the region. Xing Xian reiterates that since Supply Chain Finance is still in its infancy here in Malaysia, most of CapitalBay’s volume is driven by global banks, implementing global programmes, with their global clients. “Awareness among large corporations or most of the banks in Malaysia have been very low as well,” said Xing Xian. So to solve that issue, one of CapitalBay’s key focus areas in the future will be in educating and creating awareness among Malaysian players. One way of education is joint initiatives with local banking partners who would be looking to diversify their financing portfolio by incorporating Supply Chain Finance. For now though, this startup does have the strength of multiple transaction cycles with Bursa-listed buyers to help make their case—collectively holding more than RM2 billion worth of accounts payable. With seed funding in hand and lofty ambitions in place, we can definitely see their value preposition, and why it took them so long to get it ready. But now that it’s up, their success in changing up the scene will depend on how well they’re able to make their case to Malaysian banks and large businesses that are more locally rooted.